Abdul-Hussein MM, Abdul-Rasheed OF, Al-Moayed HAQ. The Values of CA-125, Progesterone, ß-HCG and Estradiol in the Early Prediction of Ectopic Pregnancy. Oman Med J 2012 Mar; 27(2):124-128. Keywords: Cancer Antigen -125(CA-125); Progesterone; Beta subunit of Human Chorionic Gonadotropin (ß-HCG); Estradiol; Ectopic pregnancy; Normal intrauterine pregnancy. This study aims to investigate the predictive power of maternal serum levels of CA-125, Progesterone, ß-HCG and E2 for the prediction of EP from normal intrauterine pregnancies (nIUPs). 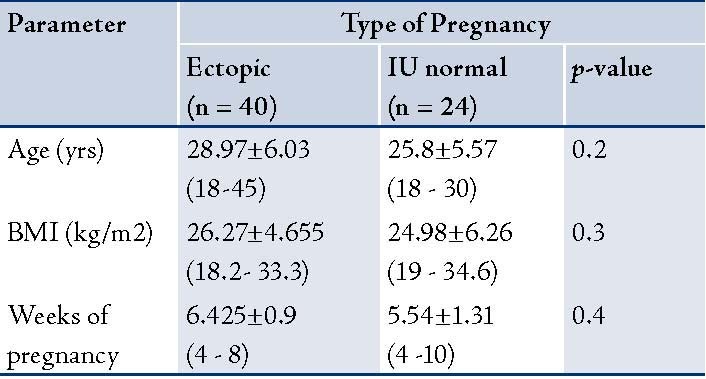 Forty women with ectopic pregnancy (EP) at a gestational age 6.425±0.9 and 24 women with normal IU gestation (controls) at a gestational age of 5.54±1.31 were studied. Blood samples from all 64 women were collected from Al-Kadhmiya Teaching Hospital, Baghdad, Iraq, between November 2010 and June 2011. The approval of the Al-Nahrain University/ college of Medicine research ethics committee and written consent of every patient included in the study were obtained. Diagnosis of ectopic pregnancy was based on clinical assessment and transvaginal ultrasonography (U/S). All EP were treated with laparoscopic salpingectomy. All women included in the control group eventually gave birth to healthy live born babies and did not undergo any gestational complication. For women with EP, blood collection was carried out immediately after admission to the hospital whereas for normal pregnancy, the blood samples were collected on the 7th day after the last menstrual period day. All blood samples were drawn by routine venipuncture. Blood samples were centrifuged at 3000 rpm and serum was stored at -20ºC. Human Chorionic Gonadotropin (hCG), CA-125, progesterone, and estradiol levels were measured by monoclonal antibody Enzyme Linked ImmunoSorbent Assay (ELISA) techniques. The values of laboratory tests are presented as mean ± standard deviation and mean ± standard error for mean (S.E.M.). The comparison of means between the different groups was performed using the Student’s t test. Receiver Operator Characteristic (ROC) curves were constructed to plot sensitivity against specificity of low CA-125, progesterone, ß-HCG and estradiol levels as diagnostic tests for EP. 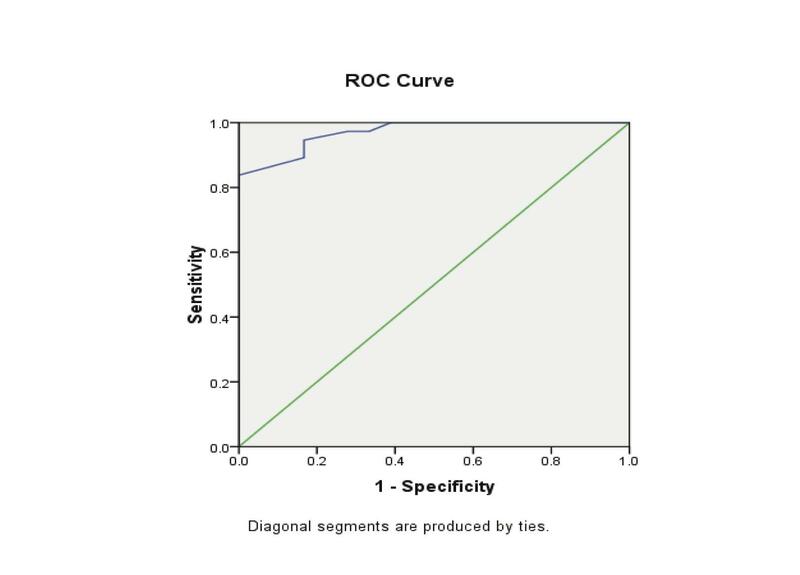 The areas under the ROC curves (AUC) were calculated and compared with the AUC (0.5) of the non-diagnostic test (the line with slope of 1). To determine the cut-off values of significant sensitivity and specificity (>70%); contingency tables (cross-tabs) were constructed for the calculation of positive and negative predictive values. Confidence intervals of sensitivity, specificity, positive and negative predicted values were calculated. All other analyses were performed using SPSS version 16 computer software (Statistical Package for Social Sciences). A p value less than the 0.05 level of significance was considered statistically significant. The basic anthropometric and clinical parameters of the patients in the study are presented in Table 1. No significant difference was observed in terms of age, gestational age and body mass index (BMI) between patients with EP and patients with normal IU gestation. The concentrations of CA-125, progesterone, estradiol, and ß-HCG of the studied patients are summarized in Table 2. CA-125 levels were significantly lower in the patient group with EP compared with the controls (p<0.005). Table 1: Basic anthropometric and clinical parameters of the women studied; (mean ± SD [minimum-maximum]). Table 2: CA-125, progesterone and estradiol, ß-HCG levels of the women studied [mean ± SEM. (minimum-maximum)]. Figure 1: Receiver Operator Characteristic (ROC) curves of low CA-125 levels as diagnostic tests for ectopic (EP). Table 3: AUC for ROC analysis of different parameters with testing for statistical differences. 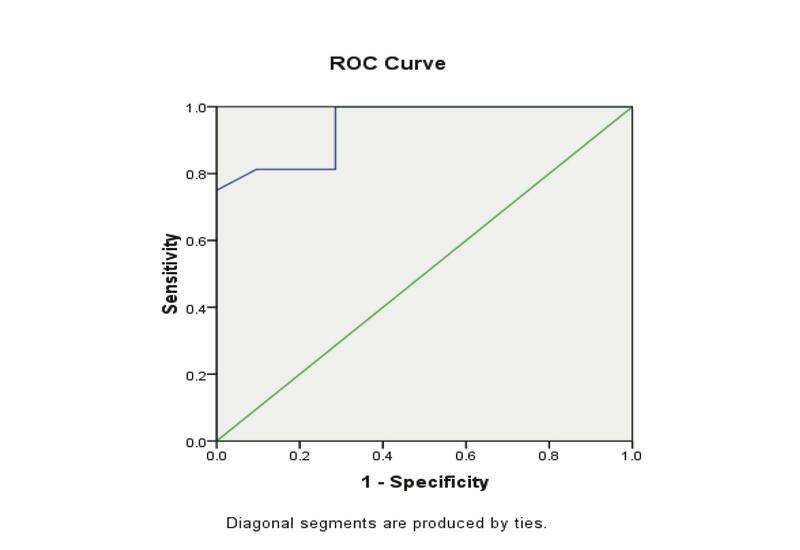 Figure 2: Receiver Operator Characteristic (ROC) curves of low progesterone levels as diagnostic tests for ectopic (EP) from control groups. 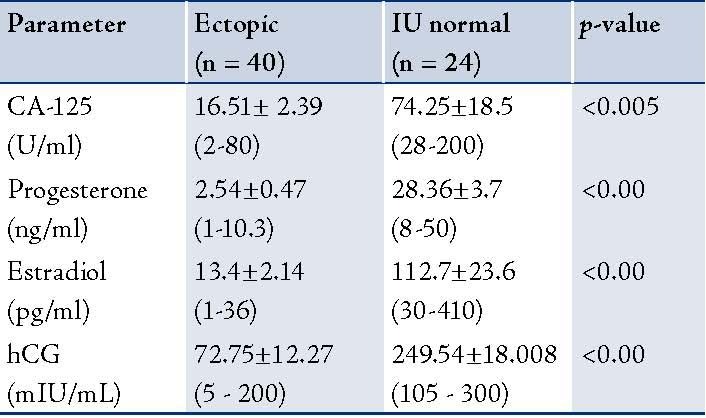 Table 4: Validity Indications of serum levels CA-125, progesterone, estradiol and ßhCG, in prediction of ectopic pregnancy. Figure 3: Receiver Operator Characteristic (ROC) curves of low estradiol levels as diagnostic tests for ectopic (EP) from control groups. Figure 4: Receiver Operator Characteristic (ROC) curves of low ß-HCG levels as diagnostic tests for ectopic (EP) from control groups. There is considerable overlap of values between normal and abnormal pregnancies at any given gestational age.21 In such cases, the measurement of serum progesterone is helpful. In this study, progesterone levels were found to be significantly lower in the EP (p<0.00), than in the NIUP group. Similar findings have previously been reported.22 These results are consistent with the results of other studies.23-25 Although each study found different cutoff levels; all concluded that progesterone measurements are important in distinguishing between normal and abnormal pregnancies. In contrast to these conclusions, Mol et al. found in their meta-analysis that the accuracy of a single serum progesterone measurement in the diagnosis of EP from non-EP pregnancies is inadequate.26 The corpus luteum of women also secretes estradiol (E2) in response to hCG and again could function as a luteal marker of pregnancy dynamics. In the current study, the results conveyed that the mean levels of E2 were significantly lower in patients with ectopic pregnancy than in patients with NIUP (p<0.00). Measurement of CA-125 levels may be of value in the differential diagnosis of ectopic pregnancy and early normal intrauterine pregnancy (sensitivity was 75.7%, specificity 100%, PPV 100%, and NPV 71.4% at a cut-off value of 20.5 U/ml). In addition, single measurement of progesterone and estradiol measurement are useful in differentiating normal from abnormal pregnancies (EP). 1. Centers for Disease Control and Prevention (CDC). Ectopic pregnancy-United States, 1990-1992. MMWR Morb Mortal Wkly Rep 1995 Jan;44(3):46-48. 2. Schmidt T, Rein DT, Foth D, Eibach HW, Kurbacher CM, Mallmann P, et al. 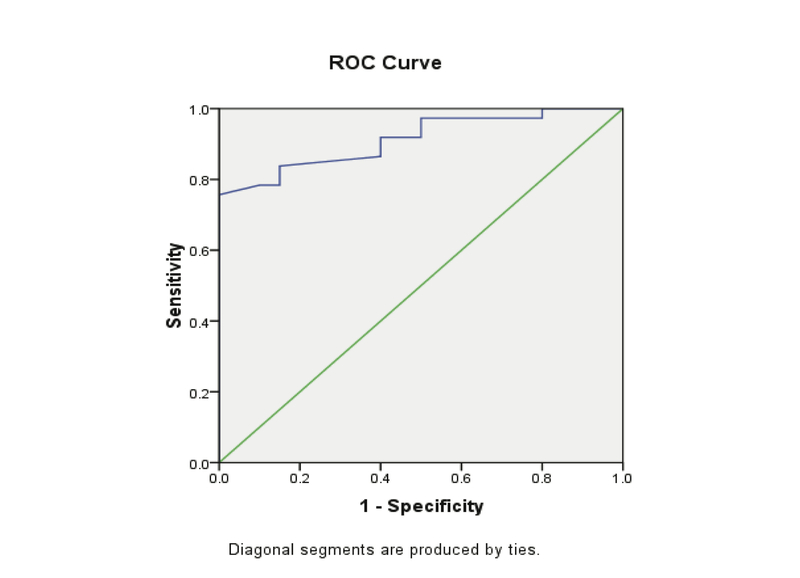 Prognostic value of repeated serum CA 125 measurements in first trimester pregnancy. Eur J Obstet Gynecol Reprod Biol 2001 Aug;97(2):168-173. 3. Kobayashi F, Takashima E, Sagawa N, Mori T, Fujii S. Maternal serum CA125 levels in early intrauterine and tubal pregnancies. Arch Gynecol Obstet 1993;252(4):185-189. 4. Katsikis I, Rousso D, Farmakiotis D, Kourtis A, Diamanti-Kandarakis E, Panidis D. Receiver operator characteristics and diagnostic value of progesterone and CA-125 in the prediction of ectopic and abortive intrauterine gestations. Eur J Obstet Gynecol Reprod Biol 2006 Apr;125(2):226-232. 5. Malatyalioglu E, Ozer S, Kokcu A, Cetinkaya MB, Alper T, Tosun M. CA-125 levels in ruptured and unruptured tubal ectopic pregnancies. J Obstet Gynaecol Res 2006 Aug;32(4):422-427. 6. Nyberg DA, Filly RA, Laing FC, Mack LA, Zarutskie PW. Ectopic pregnancy. Diagnosis by sonography correlated with quantitative HCG levels. J Ultrasound Med 1987 Mar;6(3):145-150. 7. 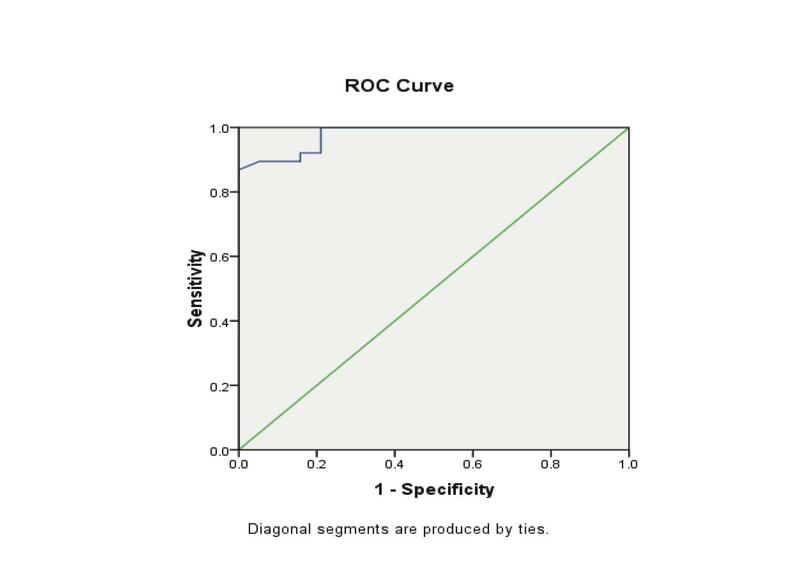 Kadar N, DeCherney AH, Romero R. Receiver operating characteristic (ROC) curve analysis of the relative efficacy of single and serial chorionic gonadotropin determinations in the early diagnosis of ectopic pregnancy. Fertil Steril 1982 Apr;37(4):542-547. 8. Milwidsky A, Adoni A, Segal S, Palti Z. Chorionic gonadotropin and progesterone levels in ectopic pregnancy. Obstet Gynecol 1977 Aug;50(2):145-147. 9. Speroff L, Fritz Marc A. Clinical Gynecologic Endocrinology and infertility Lippincott, Philadelphia. Lippincutt, Williams & Wilkins, 7th edition 2005; 259-318:1275-1302. 10. Rock John A, Jones Howard W. Telinde’s operative Gynecology In: Mark A, Rock John A. Ectopic pregnancy, Damariq. USA: Lippincott Williams & Wilkins: 9th edition;2003; 507-537. 11. Craig ZG, Ramey JM, Rochowiak MW, Brown LH, Teitelbaum H. Serum estradiol in the differential diagnosis of ectopic pregnancy. J Am Osteopath Assoc 1996 Aug;96(8):461-464. 12. Kirk E, Papageorghiou AT, Condous G, Tan L, Bora S, Bourne T. The diagnostic effectiveness of an initial transvaginal scan in detecting ectopic pregnancy. Hum Reprod 2007 Nov;22(11):2824-2828. 13. Bangsgaard N, Lund CO, Ottesen B, Nilas L. Improved fertility following conservative surgical treatment of ectopic pregnancy. BJOG 2003 Aug;110(8):765-770. 14. Seror V, Gelfucci F, Gerbaud L, Pouly JL, Fernandez H, Job-Spira N, et al. Care pathways for ectopic pregnancy: a population-based cost-effectiveness analysis. Fertil Steril 2007 Apr;87(4):737-748. 15. Cartwright J, Duncan WC, Critchley HO, Horne AW. Serum biomarkers of tubal ectopic pregnancy: current candidates and future possibilities. Reproduction 2009 Jul;138(1):9-22. 16. Brumsted JR, Nakajima ST, Badger G, Riddick DH, Gibson M. Serum concentration of CA-125 during the first trimester of normal and abnormal pregnancies. J Reprod Med 1990 May;35(5):499-502. 17. Madendag Y, Col-Madendag I, Kanant-Pekas M, Danisman N. Predictive power of serum CA-125 and LDH in the outcome of first trimester pregnancies with human chronic gonadotropin levels below discriminatory zone. Arch Gynecol Obstet 2009;279(5):826-830 . 18. O’Brien TJ, Hardin JW, Bannon GA, Norris JS, Quirk JG Jr. CA 125 antigen in human amniotic fluid and fetal membranes. Am J Obstet Gynecol 1986 Jul;155(1):50-55. 19. Kabawat SE, Bast RC Jr, Bhan AK, Welch WR, Knapp RC, Colvin RB. Tissue distribution of a coelomic-epithelium-related antigen recognized by the monoclonal antibody OC125. Int J Gynecol Pathol 1983;2(3):275-285. 20. Guvendag Guven ES, Dilbaz S, Dilbaz B, Guven S, Sahin Ozdemir D, Haberal A. Serum biochemistry correlates with the size of tubal ectopic pregnancy on sonography. Ultrasound Obstet Gynecol 2006 Nov;28(6):826-830. 21. Stovall TG. Early pregnancy loss and ectopic pregnancy In: Berek Jonathan S. Novak’s Gynecology. 13th edition. Philalelphia: Lippincott Williams and Wilkins 2002: 507-548. 22. Tuckey RC. Progesterone synthesis by the human placenta. Placenta 2005 Apr;26(4):273-281. 23. Stewart BK, Nazar-Stewart V, Toivola B. Biochemical discrimination of pathologic pregnancy from early, normal intrauterine gestation in symptomatic patients. Am J Clin Pathol 1995 Apr;103(4):386-390. 24. Stovall TG, Ling FW, Carson SA, Buster JE. Serum progesterone and uterine curettage in differential diagnosis of ectopic pregnancy. Fertil Steril 1992 Feb;57(2):456-457. 25. McCord ML, Muram D, Buster JE, Arheart KL, Stovall TG, Carson SA. Single serum progesterone as a screen for ectopic pregnancy: exchanging specificity and sensitivity to obtain optimal test performance. Fertil Steril 1996 Oct;66(4):513-516. 26. Mol BW, Lijmer JG, Ankum WM, van der Veen F, Bossuyt PM. The accuracy of single serum progesterone measurement in the diagnosis of ectopic pregnancy: a meta-analysis. Hum Reprod 1998 Nov;13(11):3220-3227.